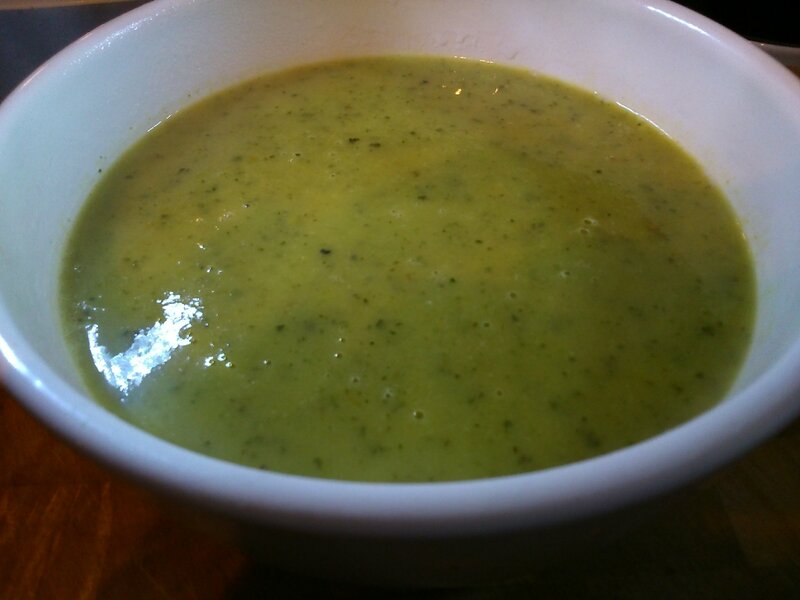 I had basil left from the pack I bought for yesterday’s recipe, and it felt like a soup evening to me. Garlic and basil are a gorgeous combination of course, and I thought of lemon peel to complement them. The peel gives the soup fragrance and flavour without the sharpness of the juice. Courgette is a perfect vehicle for the other ingredients, it’s flavour intensified by the roasting process and the texture making a silky soup. It may seem like a lot of garlic for one serving, but when it’s roasted the flavour is much milder and sweeter than raw! Firstly, roast the garlic. Using a sharp knife make a tiny slit in the skin of each clove to allow steam to escape, then wrap them up all together in a piece of foil. Pop the foil parcel in the oven for around 30 minutes, until the garlic is soft and squashy. I roasted a whole (small) head so I had some left for other recipes, if you choose to do this, it’ll take about 40 minutes. Toss the courgette, onion and lemon peel in the oil on a baking tray. Season with salt and pepper and roast for twenty minutes until the vegetables are soft and starting to caramelise. Put the stock, vegetables (leaving behind any excess oil from the roasting), lemon peel and basil into a saucepan. Squeeze the garlic from its skins into the pan and bring the soup to a simmer. Cook for five minutes, and then blend until smooth. It really was lovely! The lemon peel worked very well, and i’ll be using that method again.